I am such a sucker for a good club sandwich. When I spot one on a menu you’d think I’d never had a club sandwich before…I immediately ignore everything else as visions of turkey, bacon, lettuce, tomato and mayo start dancing in my head. And so I did with the turkey club sandwich what I have done with lasagna, french toast and boston cream pie…I took the basic ingredients and put it in a different form…basically allowing me to eat even more turkey club sandwich. Only in the case, in salad form! Now while this would be a great way to use up leftover turkey (which you may happen to have hanging around right around now…just guessing! ), don’t give up! Your deli counter will be perfectly happy to sell you a one inch wide chunk of cooked turkey the same way they are happy to sell you the thin-sliced variety. Everything else is a variation on what you would find in a classic club sandwich: lettuce, tomato, some crusty croutons (to play the part of the bread in the sandwich), a quick mayonnaise-based dressing, and of course some of this. Because what’s a club sandwich/salad without bacon? I ask you. So, the most time-consuming (and by time-consuming I’m talking about 15 minutes start to finish) part is making the croutons. You cut up a couple of slices of hearty bread into cubes (I always have a loaf of this bread around…if you haven’t made it yet, you MUST! It’s heaven in bread form.) Toss the cubes around with a little olive oil and salt and bake them for abot 10 minutes. Voila – croutons! Now mix up your mayo with some sour cream, lemon juice and chives, and spice it up with some salt and pepper. Take your prettiest salad bowl (things taste better in pretty bowls) and put the lettuce, tomato, bacon, turkey and croutons in it and toss everything around. Now add in the dressing and toss it around again. And there you have it! Turkey Club Sandwich Salad. Bring on that leftover turkey! Make croutons by tossing bread cubes with olive oil. 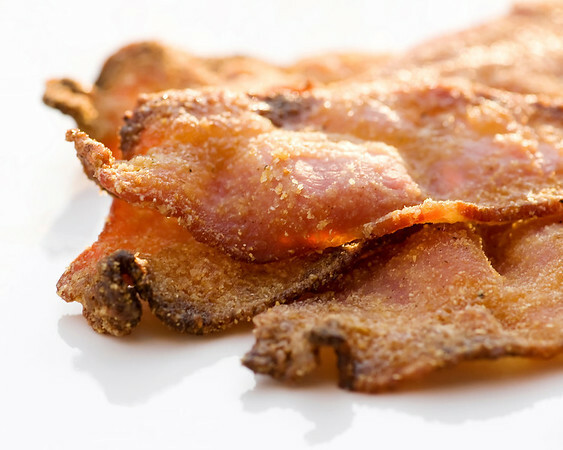 Spread in a single layer on a foil-lined baking sheet and toast in a 400 degree oven for 10 minutes or until golden. 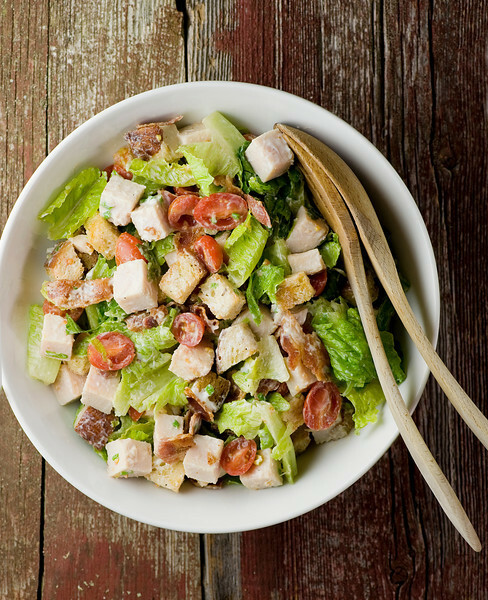 Place turkey, bacon, lettuce, tomato and croutons in a large bowl and toss until well combined. Mix mayo, sour cream, lemon juice and chives together to make the dressing. Season to taste with salt and pepper. Add the dressing to the bowl and toss again. Serve at once. What a great idea ! Though, I prob will sub aples for the tomatoes ( don’t like tomatoes in winter … ) and yoghurt for the sour creme. Got enough leftover turkey .. I am always substituting here and there – you never know what’s going to make something better! (Although on the tomato front, I have found that cherry tomatoes tend to keep their nice flavor in the winter, unlike the big ones)…enjoy! I love how turning sandwiches into salads makes them instantly healthier! Thereby letting us eat more of them. Genius plan, I tell you – genius! Made this for supper last night, with just a few changes. The grocery store was out of chives so I subbed in little green onions in the dressing. I decided to make this kind of spur of the moment, so used a take and bake loaf of peasant bread for my croutons. Also had to toast (ok, fry!) them in a skillet because my oven was occupied with drying out salt dough ornaments for a birthday party project. I also basically tripled the recipe. It was delicious! My 2 girls took the leftovers in their lunch to school today and were disappointed there wasn’t any left to have after school. Thanks for the super ideas!